This beautiful brown and blue Laurel Burch handbag features two outside side pockets, one inside zippered pocket, and her signature zipper closure. 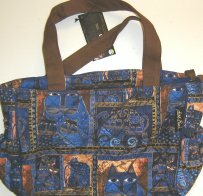 The lined and quilted bag is 12 1/2" wide x 9" high x 5" deep. Two fabric handles.